What a bungalow may lack in square footage, it makes up for in efficiency, functionality and simplicity. 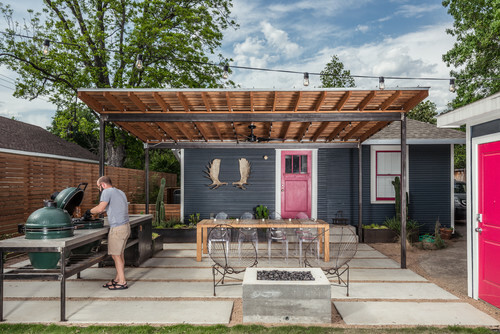 For the backyard renovation of a 1927 Houston bungalow, designer Brett Zamore channeled these traits, incorporating the homeowners’ modern preferences to build an outdoor space to enhance their everyday lives — nearly doubling their living space in the process. 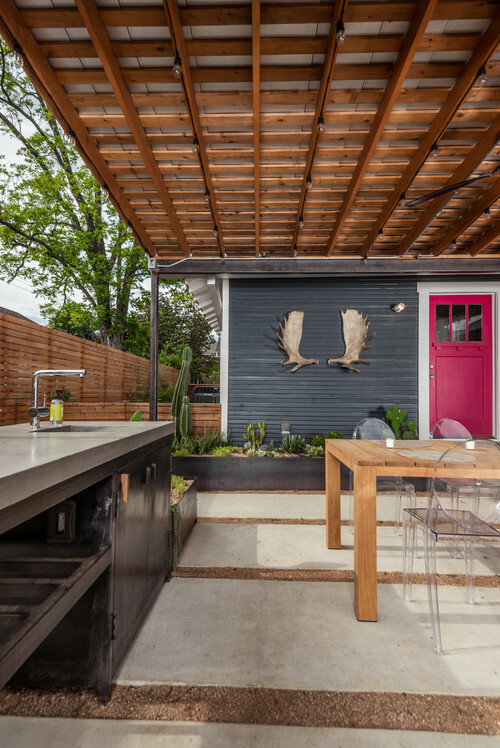 The renovation transformed the 1,300-square-foot home’s exterior, but Brett Zamore Design focused most on creating a year-round backyard retreat that could handle Houston’s hot, humid summers. 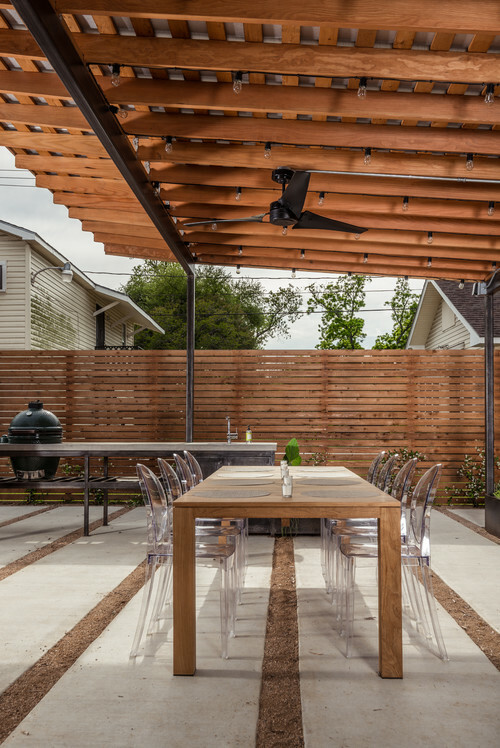 “The intent of the design was to create shaded areas, yet allow for a good amount of airflow and a feeling of lightness throughout the backyard,” says Zamore. A custom steel and wood pergola projects off the house, angling up as it extends into the backyard. A continuous gutter attaches to both the roof of the house and the pergola and drains into crushed gravel on the side yard. The pergola’s structure is independent of the house. From inside the view opens out onto the patio and invites the homeowners outside. “It’s their outdoor living room,” says Zamore. The couple, who are in their late 20s, met at summer camp. Campfires played a big role in the beginning of their relationship, so they wanted the fire pit to be a very central and accessible feature in the backyard. These iron Acapulco chairs were found at the Round Top Antique Show in Round Top, Texas. 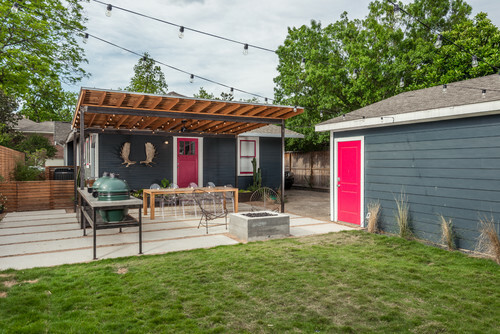 The outdoor kitchen includes two Green Egg grills. It runs perpendicular to the patio. A concrete counter tops rough steel cabinets. “We wanted to show the texture of the fabrication,” says Zamore. The moose antlers were a gift from the homeowners’ parents. Steel raised beds sit next to the open-air kitchen and along the bungalow’s foundation. Zamore maintained a minimal material palette, to focus the space and create a cohesive experience. He estimates the cost for the steel and fabrication of the kitchen, planters and pergola to be around $8,700. All of the cutting and welding of the steel tubing and sheeting was done onsite. Succulents and cacti add green to the patio area and need little maintenance. The homeowners say the steel beds under the shade structure warm the soil and create a perfect growing environment for their plants. A new cedar fence surrounds the property. “I use this type of fence quite a bit with many of my homes,” says Zamore. “I like the horizontal feel versus the typical vertical picket fence.” It gives the wood fence a modern twist and matches the design’s rhythm. Wood balances the amount of steel and concrete, warming the look of the space. Crushed granite gravel and black star gravel alternate between concrete pavers. 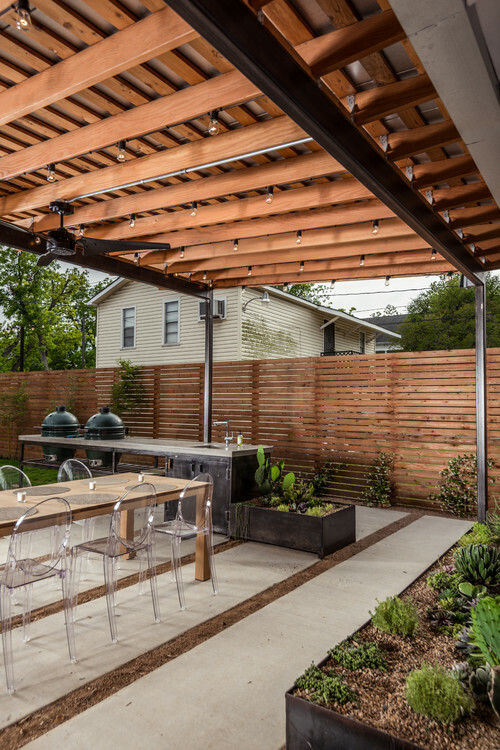 The projecting lines of the pergola, wood fence and hardscape keep the eye moving throughout the 650-square-foot patio area, providing visual interest without trying too hard. A hefty wood dining table from Janus et Cie anchors the space, giving the eyes and feet a place to rest. 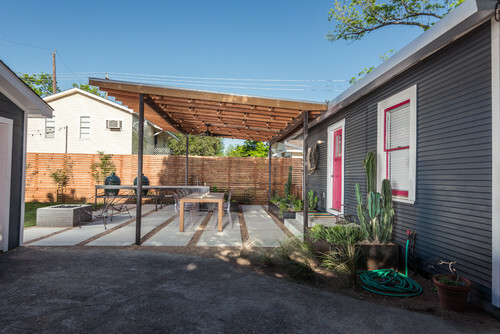 The scale and lines of the hardscape, pergola and wood fence complement the home’s siding and simplicity, with just a hint of playful modernism (also seen in the back door’s pop of pink). 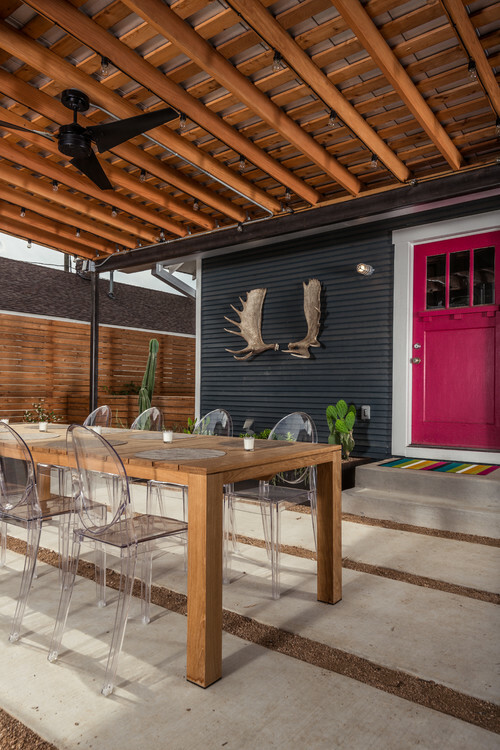 Though the yard is modern, it ties in well with the bungalow and perpetuates the neighborhood’s eclectic aesthetic. The patio now allows the house to interact with the detached garage. Zamore left a 500-square-foot lawn portion behind the patio. In contrast to the patio’s geometry, this loose area promotes free play. With dogs and perhaps kids on the way, the homeowners wanted a yard that would welcome all family members, present and future.